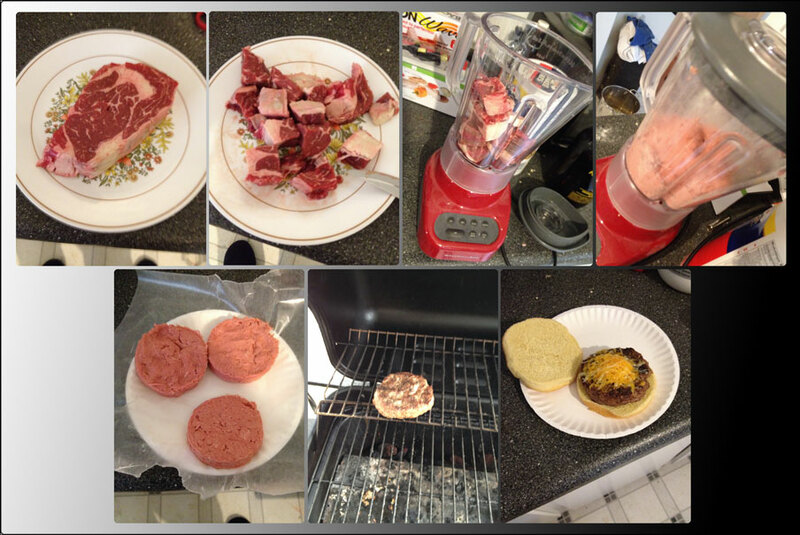 Seeing a recent news headline – “70 Percent of Ground Beef at Supermarkets Contains ‘Pink Slime’” Reminded me to make a post about one of my recent culinary experiments. I have a tendency to buy steaks at Costco, and that results in me having lots of frozen beef in the fridge. I was trying to eat my way through a package of ribeyes before they got gross, and decided to get creative and make burgers out of one. As you can see above, I used the blender. The resulting meat slurry ended up a little too finely ground for my tastes. If I ever do this again, I’m going to err on the side of “chunky”. Interestingly, these cooked through a good deal faster than the ground chuck I usually use. I think this might be attributed to the fine grind – the fat is in smaller pieces, could melt faster, and perhaps deep fried the meat from the inside out? The end result was not bad, but I think I’d have enjoyed the steak more. Roast Burger? ..more like Gross Burger. I’ve not posted any fast food in a while, so I guess it’s time. Arby’s Roast Burgers have been available for a while, and once I realized that they were just roast beef sandwiches with “seasonings” added and dressed like a burger, I decided that I didn’t want one. As is usually the case, the temptation of saving a few buck lured me in – the Arby’s e-mail list sent out another round of “Free Roast Burger with the purchase of any drink” coupons. 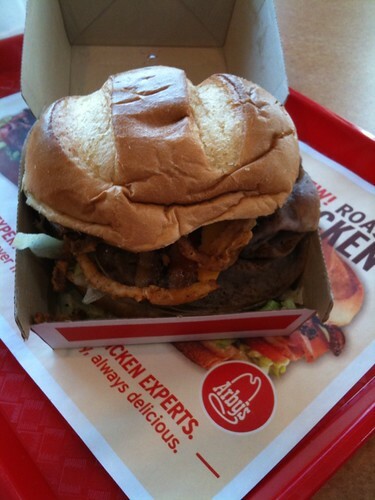 To be concise, the Roast Burger was awful. The particular variety I had was the BBQ Bacon Cheddar. It’s possible that some part of it was good, but there’s no way I would have known because the BBQ sauce was kind of gross and overpowered everything else on the sandwich with the exception of the occasional stale tasting fried onion things on top. Now that I think about it, the BBQ was so overwhelming that I can’t even remember eating the bacon on the sandwich. I couldn’t really detect the “seasoning” at all, so I can’t comment there, but I think it’s safe to say this sandwich should be skipped. Regular roast beef sandwiches are way better. I’m not sure if it’s got something to do with the economy or other factors, but I just haven’t been seeing many interesting developments in the world of fast food. As such, the fast food portion of my blog is shifting more towards the intermediate, sit-down, but still fast restaurants that seem to be popping up around here lately. So today I am reviewing the Hawaiian Hut. Located at the River Road and State street intersection between Green Leaf and Kibu cafe, The Hawaiian Hut is as the name suggests, Hawaiian cuisine.. apparently. I say apparently because I don’t really know what Hawaiian food is like. The menu seems to be mostly made up of a meat item served with rice and fruit. There are also a few salads, barbecue ribs and grilled salmon, etc. It seems like this is the only restaurant of the chain, but they have a franchise link on their site, so maybe more will come. I was unsure what to get so I took the cashiers advice and hat the Teri Hamburger Steak in the smaller size. It consisted of two small hamburger patties cooked in a very weak teriyaki sauce with a pineapple ring on each. 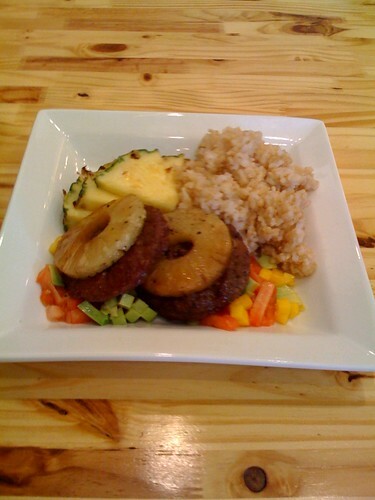 The burgers were served on a bed of diced avocado, mango and tomato with a side of rice and some raw pineapple slices. Everything was about as one would expect. 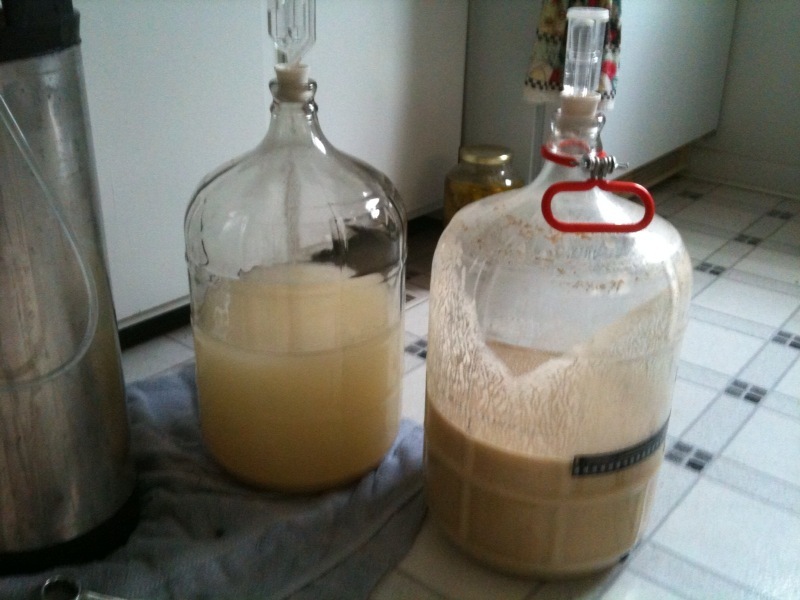 In fact I think I was a little let down that it wasn’t any weirder than it was. It was all tasty though. 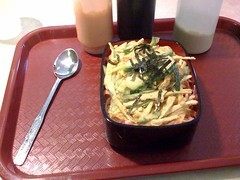 I think the avocado and mango were the best part for me. The bottom line is that Hawaiian Hut has some pretty good food, but the value (nine dollars and change for a small meal and drink) is not really there. I think the bright simulated cabana decor might be a draw for the place, especially on a cold day like this, but the price tag still seems a little off when you consider that I can totally pig out next door at Kibu for less. Still, definitely worth a try, and could be a nice place for dates, etc. 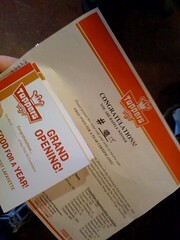 So I managed to get “Free food for a year” from Toppers pizza. 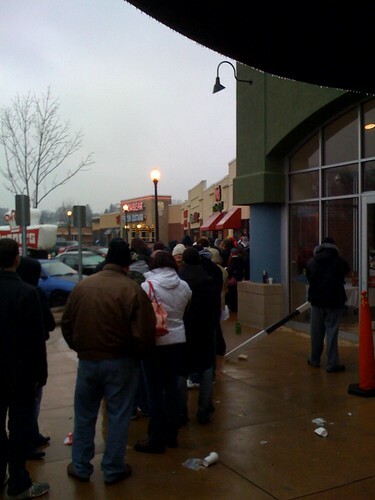 The deal was that the first 50 customers on opening day won. I researched and monitored the event, but was too apprehensive about what the free food for a year actually entailed to brave a 24 hour wait in freezing rain. I did stop and talk to the first two guys early in their sit. Said they were just bored. Anyhow, I alerted my brother to the situation, as he too is a fan of free food. I had given up on the idea of waiting, but got a text from him the day of the event at 7:30a saying there were only 35 people in line. (The store opened at 10:30) By the time my brain started working, I figured that there was still a possibility I could win, and headed to the store. I got there at 10:20a and was #66 in line. That wasn’t all-she-wrote though. 13 more FFFAY prizes were to be raffled off. I waited around and got the last one. Oddly, only 3 people who came to the “event” didn’t win. They got free pizzas though. As it turns out, the terms of the deal are that I have a coupon book with one coupon for each week for a specific item. This week it was a 12″ grinder. Next week it’s a large 2 topping pizza, etc, etc. At around $10 an item, I figure the coupon book it worth around $520 – not bad for waiting in line for a half hour! So anyway, the food.. So far I’ve had the bacon stix and a baked italian grinder. The bacon stix were pretty good. Similar to Mad Mushroom cheesestix and covered in bacon. They have several other topped cheesestix, and I will investigate those in the coming weeks I’m sure. The grinder was not bad. It was pretty basic, with bread like Quiznos, and for what it’s worth, a 12″ is definitely enough for two people to split. I’m looking forward to trying out the pizza. I will report on it when I get the chance and see how it fits in Lafayette’s pizza landscape. I am somewhat apologetic that my food bloggings have drifted towards the local lately, but I must admit that not much in the realm of fast food chains has really interested me much lately. So anyway, another local item of interest – the Bluefin Bistro in downtown Lafayette has been doing unlimited sushi rolls for lunch the past couple of weeks. At a $7.95 buy-in, I had to give it a shot. I’ll save an overall review for another time after I’ve had a regular meal there, but for the purposes of this post, I will say that the place is still pretty nice, albeit pretty empty. The wait staff was helpful and not annoying, and the food was more than I’d expect for $8 all you can eat. That said, the sushi wasn’t _awesome_; merely good. I suspect the lunch special changes things a little, but overall, the rice was a little more dry than I prefer, and the rolls contents were a little skimpy. The special menu consisted of pretty much the standards, with the biggest outlier being the Bistro roll which was asparagus tempura. The rest of the regular menu was somewhat adventurous. Regardless of the quality, the value is pretty darned good. I recommend checking it out, and I’ll definitely be going back to try their full menu.